Observation - Dark Marbled Carpet Moth - UK and Ireland. Description: I think this is a Dark Marbled Carpet from the illustrations in 'Collins complete guide to British Insects'. But it also says that it's not easily distinguished from the Common Marbled Carpet, so not sure. I think this is a Dark Marbled Carpet from the illustrations in 'Collins complete guide to British Insects'. 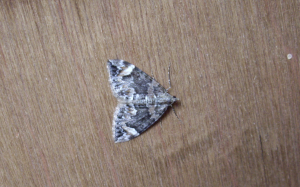 But it also says that it's not easily distinguished from the Common Marbled Carpet, so not sure.